It is accessible by road a sleepy village 10 kms from Pahalgam, is a picturesque meadow. One can see waterfalls on the way. It is also the first step on the way to the world famous Kohlai glacier. From here one can also trek to Tarsar, Marsar lakes or Sonamarg. 16 km away, accessible by road is the starting point for the annual Amarnath Yatra. It has a snow bridge over river Sheshnag. One can sledge over the snow bridge. One can go upto Sheshnag lake in a days return trek. 3 kms away, accessible by pony, also motrable is a lush green meadow surrounded by thick forest. One can trek upto Tulian lake from here (a day's trip). Accessible by Pony only Known as mini Switzerland, it takes you on a hill top with a breath taking view of the entire valley. Accessible by road it is a stretch of 6 Km's. It takes you through the hutment area. A very beautiful drive. Shikergah, and Mahabaleshwar is an ancient Temple which dates back to 14th century which can be travelled on foot or pony. A days trip by car It is one of the three Sun temples in India. A must visit. A day's trip by car A trip to where river Jhelum originates and beautiful gardens along the countryside. A new scenic 18 hole golf course with refreshing view of pine trees & snow clad mountains is now open for golf lovers. It is of international standards & on the lines of Royal Spring golf course Srinagar. Pahalgam offers white water river rafting in the river 'LIDER" during April to August. Pahalgam is angler's paradise with brown & rainbow varieties of trout for fishing. Around the vicinity in Pahalgam one can visit Pahalgam Club which has lovely lawns, Bobby hut, Poshwan Park which means Garden of flowers & Lavender Park. Amarnath Pahalgam is also the starting point for darhan to Amarnath cave. It is the traditional route and it takes about 2 days to complete the jouney either by foot or by pony. All arrangements for treks and sightseeing can be made through the hotel itself. Pahalgam Hotel ensures that your stay will be a memorable one! Arrive Srinagar, pride of the beautiful valley of Kashmir famous for its lakes dotted with Shikaras and the Mughal Gardens . Transfer to Hotel/ Houseboat. , Excursion to the Mughal gardens built by Emperor Jehangir. Also visit to the Shalimar bagh & Nishat bagh other beautiful gardens located on the eastern side of the Dal lake.shikara ride to Nehru Park in the evening, Overnight in the Hotel. You can enjoy leisurely walks in pine forest along River Lidder and enjoy picnic on riverside. You can enjoy pony ride to Baisaran meadow, surrounded by thickly wooded pine forest and snow-capped mountains. This grassy glen offers a panoramic view of Pahalgam town and Lidder Valley. Return to Srinagar ,Over night at hotel. After breakfast depart for a full day excursion to Gulmarg, Meadow of Flowers ( 56 km /2 hrs) situated at an altitude of 2730 meters, full day at leisure to take the leisurely walks on the lush green meadows of flowers with a backdrop of the snow capped mountains. Enjoy pony ride or Gondola ride (rope way) to Khillanmarg at your own cost. Return to srinagar ,Over night at hotel. After breakfast transfer from Gulmarg to Airport With sweet memory of you trip to get onword destination flight. Site Seen Of Chandanwari /Aru Valley / Betaab Valley In pahalgam . Pony Ride /Gandola Ride/ Sledge in Gulmarg . Thajwas Glacier / Pony Ride / Sledge In Sonmarg . Chain Car from tangmarg to Gulmarg (During Heavy snow Fall). Excursion to the Sonmarg . The mountains around Sonamarg(84 kms/2 ½ hr) are covered with several glaciers, one of the most famous being the Thajiswas Glacier. This scenic river of ice is set amidst lush meadows and foliage and is a three-km walk or pony ride.Overnight in the Hotel..
You can enjoy pony ride to Baisaran meadow, surrounded by thickly wooded pine forest and snow-capped mountains. This grassy glen offers a panoramic view of Pahalgam town and Lidder Valley.Over night at hotel. This morning you will proceed for a full day excursion to Gulmarg, Meadow of Flowers (154 kms /4 hrs) situated at an altitude of 2730 meters, full day at leisure to take the leisurely walks on the lush green meadows of flowers with a backdrop of the snow capped mountains. Enjoy pony ride or Gondola ride (rope way) to Khillanmarg at your own cost, Overnight in the Hotel. This morning you will proceed for a full day excursion to Gulmarg, Meadow of Flowers ( 147 kms /3 1/2 hrs) situated at an altitude of 2730 meters, full day at leisure to take the leisurely walks on the lush green meadows of flowers with a backdrop of the snow capped mountains. Enjoy pony ride or Gondola ride (rope way) to Khillanmarg at your own cost. Overnight in the hotel. After Breakfast you will proceed to the Sonmarg . The mountains around Sonamarg(84 kms/2 ½ hr) are covered with several glaciers, one of the most famous being the Thajiswas Glacier. This scenic river of ice is set amidst lush meadows and foliage and is a three-km walk or pony ride. Overnight in the Hotel. After Breakfast drive to Srinagar . half day excursion to the Mughal Gardens, located on the eastern bank of the Dal Lake i.e. Shalimar Bagh, Nishat Bagh, Chashm-e-Shahi and botanical gardens. In the evening shikara ride to Nehru Park. Dinner & overnight in the houseboat. After Breakfast you will proceed to Wular Lake (60 km)is situated between Bandipora & Sopore .this is the largest Fresh water lake in india. Circumference of lake 48 km is full of mountains and denseforests.Legend describes Wular as a ‘cave’ where a city was once swallowed up by the earthquakes and floods.Wular is a mystic lake .The water nuts grow in a large quantity in some portions of lake . # Manasbal Lake(48 km from sxr):Ganderbal –Sonmarg road is the placid Manasbal lake.4 km long and 1.2 km wide lake is famous for Lotus ,water nuts and colorful migratory birds.Belived to be deepest lake as its depth is measured to about 12.8 km at some places.The shikara ride(at your own cost) in the lake offers most fascinating scenes of surrounding nature.In the Evening, Return back to Srinagar. Dinner & overnight in the houseboat/ hotel. Arrive Srinagar, pride of the beautiful valley of Kashmir, famous for its lakes dotted with Shikaras and the Mughal Gardens. Transfer and check into the houseboat. Post lunch half day excursion to the Mughal Gardens, located on the eastern bank of the Dal Lake i.e. Shalimar Bagh, Nishat Bagh, Chashm-e-Shahi and botanical gardens. In the evening shikara ride to Nehru Park. Dinner & overnight in the houseboat/hotel(as per booking). After breakfast drive to Pahalgam, ‘Valley of Shepherds’ (94 km/ 03 hrs). Enroute you will have an rare opportunity to visit the Saffron fields., Avantipura Ruins, Avantipura cricket bat factory & Anantnag Sulpher Springs. Enjoy the bounty of Nature at Pahalgam, located on the bank of beautiful Lidder River. Dinner & overnight in the hotel. Visit to Aru Valley which is a small village, 15 km upstream the Lidder River, The route is picturesque with ample campsites. This village is the starting point for treks to the Kolahoi glacier. Vsist to Chandanwari, 16 Km which is the starting point of sacred Amarnath Yatra. Chandanwari is famous for snow sledging on a snow bridge, Enroute you can visit Hajan, an idyllic picnic spot and Betaab valley where the famous Bollywood movie Betaab was shot. You can enjoy pony ride to Baisaran meadow, surrounded by thickly wooded pine forest and snow-capped mountains. This grassy glen offers a panoramic view of Pahalgam town and Lidder Valley. Dinner & overnight in the hotel. After breakfast drive back to Srinagar . Upon arrival check into the hotel. Rest of the day at leisure for shopping. In the evening visit to Shankaracharya Temple, set atop a hill overlooking the Srinagar city. Enjoy the panoramic views from the top. Dinner & overnight in the hotel. After breakfast depart for full day excursion to the Sonmarg, ‘Meadow of Gold’ (84 km/ 03 hrs) on Srinagar- Leh road, A gushing river is the highlight of this meadow, flowing down from snowy heights into the dense woodlands of firs and silver birches. Glaciers pour down from this stream from the Himalayas on to the many camping sites in Sonmarg. A thick forest cover of sycamore, alpine flowers, silver birch, fir and pine, Sonmarg offers adventure in the form of treks, sledging, angling, alpine skiing and white water rafting. Enjoy pony ride (at your own cost) or leisurely walks around the meadow. Return back to Srinagar. Dinner & overnight in the hotel. After breakfast, transfer to airport for your onward flight back home. Meet our representative at Srinagar airport, transfer to hotel / Houseboat. Afternoon, leave for local sightseeing of Srinagar City. Visit: - Mughal gardens: - Chesma Shahi (Mughal Spring), Nishat (The Garden of Bliss), Shalimar (The Abode of Love). In the evening, Shikara ride in world famous Dal lake. Overnight stay at Srinagar. After breakfast, transfer to Gulmarg for a daytrip via Tangmarg, Enroute Apple Orchards, Cherry Orchards and Strawberry fields. In Gulmarg visit Khillanmarg and take a ride in world’s highest cable car "Gondola" or enjoy your day by playing golf in the world’s highest golf course. Return to Srinagar in the evening after enjoying your day. Overnight stay at Srinagar. After breakfast, transfer to Pahalgam for a daytrip, Enroute visit Awantipora Ruins, Saffron Fields. In Pahalgam you can visit: - Aru, Betaab valley (on your own cost). Return to Srinagar in the evening after enjoying your day. Overnight stay at Srinagar. After breakfast, transfer to Sonmarg for a daytrip. Enroute see Hazratbal Shrine, Gagangir Tourist Village. The drive from Srinagar to Sonmarg is very beautiful as you will pass through some towns and villages, at many places you can enjoy the view of paddy fields with rivers flowing on one side. In Sonmarg you can visit Thajwas Glacier which is around 4 Kms from Sonmarg; a local taxi has to be hired for it. The name Sonmarg is derived from two Kashmiri words “Son” & “Marg” which mean “Gold” & “Meadow”, when put together it means “Meadow of Gold”. Return to Srinagar in the evening after enjoying your day. Overnight stay at Srinagar. After breakfast, transfer to Srinagar airport..
03 nights in Hotel in Srinagar. MAPAI basis (Breakfast + Dinner). Entry Fees Of Mughal Garden . In Case Said Hotel will not Available, Same Hotel Category of hotel will Booked. Rates are not valid for Season or Peak Season Time. Rate can be change without prior notice. In case of A/c not working due to any technical faults difference between A/c and Non A/c Charges will be refunded. Arrive Srinagar drive to Pahalgam, ‘Valley of Shepherds’ (94 km/ 03 hrs). Enroute you will have an rare opportunity to visit the Saffron fields., Avantipura Ruins, Avantipura cricket bat factory & Anantnag Sulpher Springs. Enjoy the bounty of Nature at Pahalgam, located on the bank of beautiful Lidder River. Dinner & overnight in the hotel. Visit to Chandanwari, 16 Km which is the starting point of sacred Amarnath Yatra. Chandanwari is famous for snow sledging on a snow bridge, Enroute you can visit Hajan, an idyllic picnic spot and Betaab valley where the famous Bollywood movie Betaab was shot. After breakfast drive back to Srinagar . half day excursion to the Mughal Gardens, located on the eastern bank of the Dal Lake i.e. Shalimar Bagh, Nishat Bagh, Chashm-e-Shahi and botanical gardens. In the evening Shikara ride to Nehru Park. Dinner & overnight in the hotel. Chain Car from tangmarg to Gulmarg (Road are Blocked due to Snowfall). Arrive Srinagar, pride of the beautiful valley of Kashmir famous for its lakes dotted with Shikaras and the Mughal Gardens . Transfer to Hotel , Excursion to the Mughal gardens built by Emperor Jehangir. Also visit to the Shalimar bagh & Nishat bagh other beautiful gardens located on the eastern side of the Dal lake.shikara ride to Nehru Park in the evening, Overnight in the Hotel. After breakfast Enjoy pony ride or Gondola ride (rope way) to Khillanmarg at your own cost. Dinner & overnight in the hotel. The Khyber Himalayan Resort & Spa, Gulmarg located at an elevation of 8,825 ft. in the Pir Panjal range of the majestic Himalayas is spread over seven acres in a pristine pine valley. This 85-key resort, offers breathtaking views of snowcapped Affarwat peaks. Also situated here is The Khyber Spa by L’OCCITANE with stunning vistas from all its treatment rooms, offering luxurious and holistic spa treatments inspired by the rituals of Provence, France. The Wellness Block includes a Gym, and a heated indoor swimming pool. 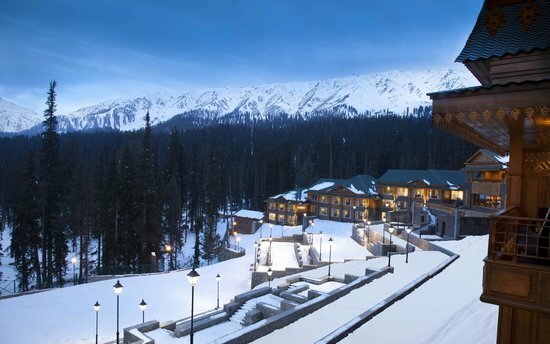 The resort is an easy walk from the Gulmarg Gondola, the highest ski lift in the world. The Booking window is open until 30th December 2017 and subject to availability of Premier rooms. Minimum length of stay should be 02 Nights to avail this special package. The stay period should be either 30th December 2017 and 31st December 2017 or 31st December 2017 and 01st January 2018.